Fife Flyers overcame a double injury blow to hold on for a crucial victory over Manchester Storm, but the major talking point surrounded an ugly post-match brawl that left a player suffering from concussion. Following a feisty, hard fought encounter, the players had completed their hand-shakes and were gathering for the man of the match presentations when Storm's Dane Byers broke away from his team mates to become involved in a heated argument with Fife defenceman Evan Stoflet. The incident quickly got out of hand with the entire Storm team skating across to the Flyers side of the rink, and amid the pushing, shoving and gnashing of teeth, Harrison Roupp and Stoflet became involved in a bare-knuckle brawl that ended with the Fifer falling backwards and hitting his head off the ice, resulting in a concussion. It took several minutes for the incident to wind down, with Storm coach Ryan Finnerty and Fife assistant coach Jeff Hutchins both on the ice attempting to steer their players back towards their stations. The end result was the Storm man of the match presentation being abandoned as the team skated straight to the dressing room to a chorus of angry boos from the home fans, before rink security formed a guard of protection around the tunnel entrance. 5+Game penalties were handed to both Roupp and Stoflet, while Fife's James Isaacs, and Storm's Shane Bakker and Byers all received 2+10 for unsportsmanlike conduct. Videos posted on social media showed that Storm defenceman Linden Springer was incredibly fortunate to avoid punishment for his particularly unsavoury part in the incident as he appeared to land punches on a defenceless Isaacs, who was being held back by one his Storm team mates. The footage will now be reviewed by the Department of Player Safety with the suspensions more than likely. 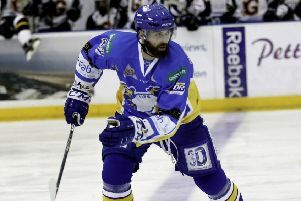 A fuming Fife head coach Todd Dutiaume called for serious disciplinary action to be taken. "That harks back to where we were 20 years ago as a league," he said. "It's embarrassing and it's so frustrating that in this day and age we have guys that know video cameras are on them, going into a pile of guys at the end of the game, and randomly sucker punching people in the face. "That's how serious injuries start. That's a person with no respect for people on the ice, and who tries to hurt people. "My main concern is that we have player safety. "It's important they (DOPS) look at the video and recognise reckless aspects out there by individuals that have no business being in this league any more." Storm coach Ryan Finnerty, on the other end, kept his counsel on the incident. "I didn't really see how it started, I just saw the guys coming together," he said. "It's something you don't want to see. There's was a little bit of pushing and one fight, but I can't really comment on why it started at this point." The melee overshadowed a Fife win that was huge both in terms of the play-off push, and in terms of building on the confidence gained from the previous week's win over Glasgow Clan. But it came at a cost as both Paul Crowder and Scott Aarssen were forced out of the game following high impact hits that were deemed to be legal by the match officials. Crowder has been diagnosed with a concussion, along with Stoflet, while Aarssen has picked up a shoulder injury. Dutiaume even suggested afterwards that Crowder had been kicked in the head but added: "I'm sure it was inadvertent." The injuries - and the sense of injustice at the lack of action from the referees - certainly knocked Fife off their stride and in the end they relied heavily on a man of the match performance from netminder Shane Owen to hang onto their 2-1 lead. Flyers killed off an early penalty for too many men before taking the lead on the sixth minute with a goal that was simple and effective. Brett Bulmer carried the puck behind the net, picked out the inrushing Danick Gauthier, and the French-Canadian slapped a one-timer past Matt Ginn. At this stage Flyers were outskating Storm, and the visitors turned up the physicality, for which they are notorious, in an attempt to get back into the game. Byers took two minutes for roughing up Bulmer - a needless penalty which Flyers failed to punish - then Crowder was poleaxed mid-ice and sent flying through the air, losing a glove in the process. The hit forced him back to the dressing room and out of the game, with Bari McKenzie stepping up the line-up to fill in. If the Storm plan was to upset Flyers rhythm then it seemed to work as they were level on 12.25 when Byers overpowered Mike Cazzola to net from close range. Flyers had chances to regain their lead before the first interval, none better than Basara, who appeared set to put the finishing touch to a flowing move as he manoeuvred his way past the netminder, but miscontrolled the puck at the crucial moment with the net gaping. The story of missed chances continued into early part of the second period when Flyers failed to punish another needless roughing penalty taken by Luke Moffat for throwing a punch at Joe Basaraba behind the play, then also somehow contrived to mess up a three-on-one breakaway. Flyers had moved the puck well in period one, but clearly unsettled, their play had now become untidy, allowing Storm to get a foothold in their zone, and Owen was suddenly facing a barrage of shots. Another thumping hit, this time Shane Bakker crushing Aarssen against the boards, left the Flyers D-man in pain as he dragged himself off the ice. With two players injured, and no call against either hit from the match officials, Flyers frustration was clear to see. However, they channelled their anger into raising their game, and in a barnstorming finish to the second period they restored their lead. Fittingly, it was McKenzie who got on the end of Cazzola's pass to chip the puck beyond Ginn. The loud roar that greeted the goal was the crowd getting their frustration out too. Flyers would need Owen to get them through some challenging moments in period three, and the netminder was tuned-in, making a number of key saves, particularly during a Storm powerplay after Evan Bloodoof was penalised for chipping the puck over the plexiglass. Storm withdrew Ginn for a six-on-five advantage for the final two minutes, but Flyers battled their way to the finish line. Both teams now await the fall-out from what followed.